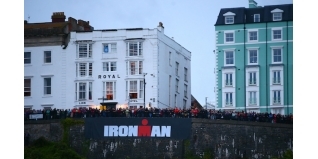 As thousands of athletes descend on Tenby, the entire county of Pembrokeshire is getting ready for the thrill of IRONMAN Wales and IRONKIDS Wales this weekend. The weekend’s racing may not yet be underway, but the talk of the town is already buzzing with anticipation of the future of the race, with the whole county keen to see it here to stay. Organisers IRONMAN are therefore delighted to confirm that IRONMAN Wales will return to Tenby on Sunday 10th September 2017. Furthermore, IRONMAN and Pembrokeshire County Council are working towards a long term agreement for the event to remain in the county, which is estimated to bring around £3.5 million to the local economy. If successful it will guarantee the event’s future until 2021 - its tenth anniversary. On site entries for 2017 will open at 9.30am at the Merchandise Stand, Five Arches, on Monday 19th September, followed by online entries opening at 3pm via www.ironman.com/wales. The Council’s Cabinet Member for Transportation and Major Events, Councillor Rob Lewis said: “With the help of the Pembrokeshire Coast National Park Authority, we are delighted to announce that IRONMAN Wales will be returning to Pembrokeshire in 2017. Amongst the 2,000 athletes entered for IRONMAN Wales, in what is arguably the toughest race on the IRONMAN calendar, are a trio of Welsh Rugby legends tackling this ultimate endurance challenge, Shane Williams, Ryan Jones and Ian Gough. Williams returns for the second year running, despite having sworn on the 2015 finish line that he wouldn’t do it again! This year he returns with competition in tow, having put some pressure on former team mates Ryan and Ian to take part with him. En route to Tenby today, Williams commented, “I honestly thought I wouldn’t do it again but it was such an amazing experience, that I’ve lured a couple of former internationals with me this time to add to the competition - with a few beers and more importantly pride at stake between us! Ryan Jones added, “I did a charity bike ride with Shane, and for six days he was in my ear, 'You've got to do it, you've got to do it.' So come the middle of June, I signed up. As this impending Ironman approaches, I'm probably as nervous, if not more nervous, than I've been before any other sporting event. "The Ironman is arguably the toughest one-day event you can do – it's as tough as it comes," added Ryan. "It's frightened the life out of me but it's also given me a renewed purpose, it's given me a focus. "I'm not a long distance runner by any stretch of the imagination. I've got plates in one leg, I've had my knees done, I've got a bad back, I've had all sorts, so I'm part bionic. But I'll finish it." The weekend’s events are free for spectators to come and watch and spectators are very much encouraged to come and spur on these rugby legends together with all the amazing athletes, which so often provides the support they need to make it to the finish line. IRONKIDS will kick off the weekend’s action at 3pm, on Saturday 16th September. A sell out 1,000 kids, aged 3-14, will mark the start of this annual IRONKIDS event, now in its 6th year which takes place in and around Tenby town centre. The distances vary according to their age group, with all finishing on the Esplanade under the iconic IRONMAN arch. The main event of IRONMAN Wales gets underway at 7:10am, on Sunday 18th September. Starting and finishing in Tenby, the event comprises a 2.4 mile swim off North beach, a 112 mile bike race around South Pembrokeshire followed by a 26.2 mile marathon run. With the action taking place across Pembrokeshire there are a number of opportunities and venues to view the event, including Tenby’s North beach, Carew, Narbeth and Saundersfoot for the bike and Tenby’s town centre for the run and finish on The Esplanade. There is a spectator guide available on www.ironmanwales.com outlining key vantage points and route access. Park and ride will once again operate from Carew to enable residents and spectators to get into Tenby to watch the action. Tickets will be available in advance via the local Tourist Information centres as well as the Registration Marquee at Five Arches. For the event schedule and key timings please visit HERE. Event highlights will be broadcast initially on S4C on Sunday 25th September at 6.15.